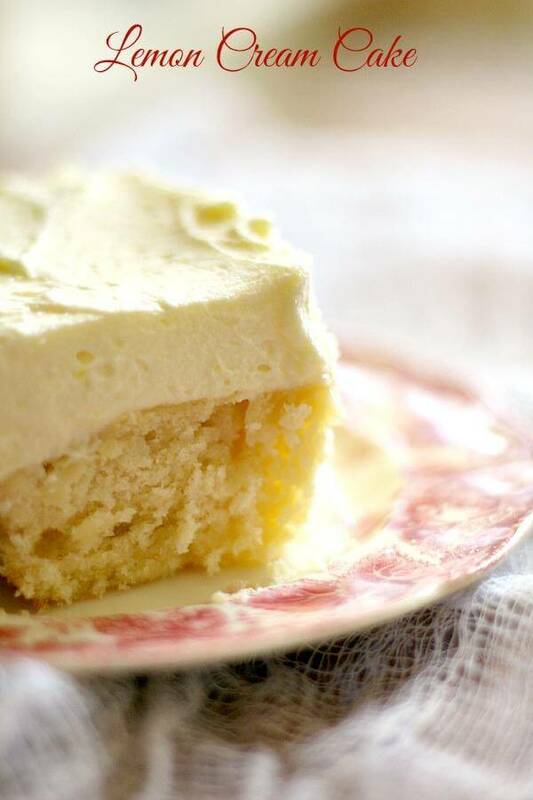 This homemade lemon cream cake is a twist on the Olive Garden favorite. I made a sheet cake but you could make a layer cake instead. The cake is moist and tangy and the frosting is a cloud of rich creaminess. This is sure to be a family favorite. I am usually not big on lemon cake. I don’t eat cake often and if I am going to indulge myself in that many carbs then I prefer it’s chocolate. This lemon cream cake may be the one cake that breaks that pattern. The crumb is tender and moist with strong lemon flavor without it being puckery. The creamy frosting covers it like a cloud of yumminess. How’s that for a professional description? Sometimes you just need a cake that you can put together quickly, or at least I do. Layer cakes are great but let’s face it — they can take an entire afternoon to finish. Even longer if you are going to decorate it. A sheet cake is perfect for those quicks cake cravings, or to take to a potluck, or any kind of cake you have to transport somewhere. If it’s warm you definitely want to keep this in the fridge. Now, you can easily make a layer cake out of this by using 2 8-inch round pans. There should be plenty of frosting to fill and frost it but if you like thick frosting you might want to double the recipe. Personally I am all about thick frosting! When I am working with lemon for a cake or some other dessert I always catch that scent that makes your mouth water — you know tangy, fresh lemon — and it reminds me of the shampoo I used when I was a teenager. There were two shampoos that I used because they smelled so dang good. Gee Your Hair Smells Terrific seemed to make your hair smell good for days despite the stalker commercials. Seriously, if someone went around smelling my hair I’d call 911! Anyway, the shampoo I used more often was LemonUp and as I recall you could get a body spray in the same scent. It seriously smelled like fresh lemon. I loved that stuff. Now we have all kinds of shampoos to straighten, curl, hydrate, repair, and lighten but nothing compares to those from the 70s. You used to be able to get both of those online at the Vermont Country Store but they’ve recently stopped carrying them. Don’t you just love how I get off track? Blame the ADD. Now, making this cake won’t make your hair smell good but it will make the house smell good and that’s even better. The following are affiliate links. If you click through and buy something I get a small commission which is used to keep the blog up and running smoothly. Thank you for being a part of Restless Chipotle! I rarely use aluminum pans in my baking. I prefer glass and ceramic. I love this white porcelain 13×9-inch baking dish. It’s pretty and makes this plain cake look amazing. I have been just using links because it’s faster for both of us but you HAVE to see these dessert plates! They are gorgeous, aren’t they? 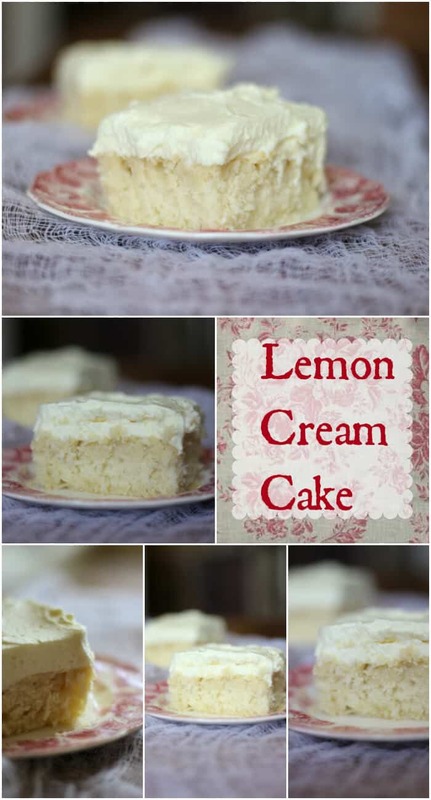 Here’s that lemon cream cake recipe. Moist, buttery lemon cake with a creamy, rich whipped topping is quick and easy to make for birthdays or potlucks. Mix the flour, baking powder, lemon zest, and salt. Beat the butter and sugar on medium speed until fluffy - about 5 minutes. Beat in the lemon extract. Mix the lemon juice and milk. Add the flour alternately with the milk mixture, beginning and ending with the four. Spoon into prepared pan and bake for 20 to 25 minutes, or until done. Add the heavy cream to the chilled bowl of a mixer. Beat on medium and until the mixture starts to thicken then add the pudding mix, powdered sugar, and lemon juice. Beat on high until the frosting is thick and creamy and holds its shape on a spoon. Frost the cooled cake with a thick layer of frosting. Is this instant pudding, or the cook and serve ? Hello! This cake tastes great, but the cooking time is way too short. Just thought I’d let you know, thanks! Looks delicious and kind of refreshing … can a cake be refreshing? I think lemon desserts are always a good idea. I think so too, but especially in the spring. This sounds incredible. I love lemon! Goodness this looks absolutely amazing! I love lemons and this look so Ike’s he perfect spring dessert for tea time!! What a gorgeous cake Marye. I swear I have ADD too, happily reading along and didn’t even realize we were no longer talking about cake! Doesn’t bother me a smidge, we’re two peas in a pod. Ummm…. back to cake! I love the idea of a layered cake but it’s a ton of work, yes and this is just quick and go. This looks better than the Olive Garden one, can’t wait to try. I love a whipped cream frosting, it is by far my favorite. I can just imagine how good this cake smells baking and tastes. 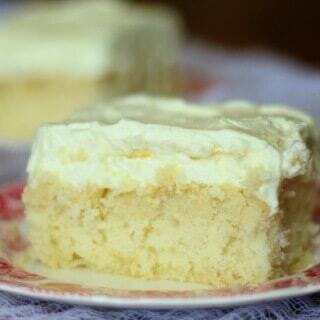 your lemon cream cake’s color beautiful as spring sun Merye..love lemon cake! Oh yummy! 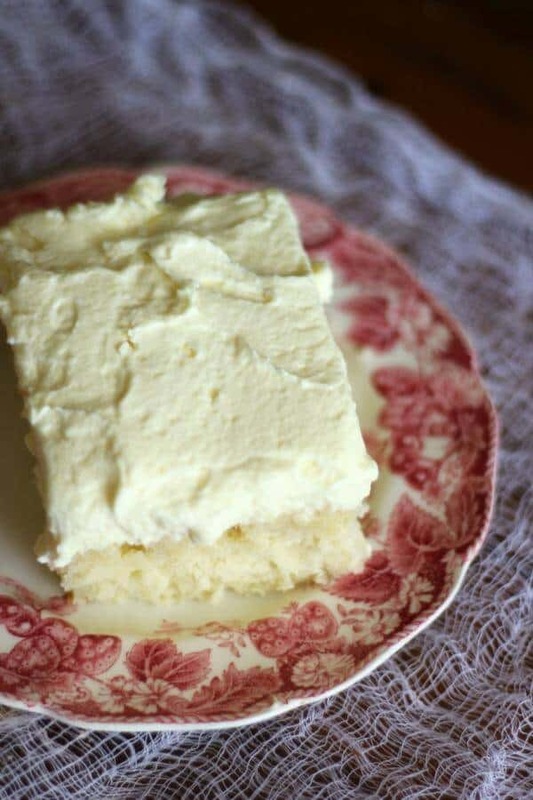 This cake sounds wonderful and I want to eat that whole bowl of creamy lemon pudding frosting! This looks so good! We always get a ton of lemons from my MIL and looking for new ways to use them, this would be perfect!